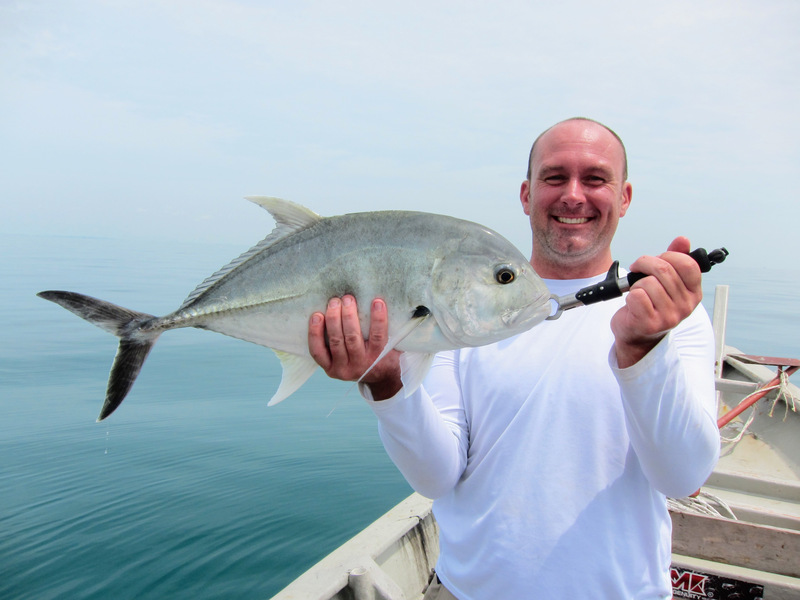 Port Dickson catch report over the past week has been exceptionally good and we were lucky to be able to head out on 1 Feb with Sam Pascoe. Sam were in Sabah for his nature sightseeing adventure. Luckily the boat is available as he decided to give it a go in Port Dickson. It was all last minute, but we were always ready and thanks to the Federal Day, it was a clean and smooth journey into the city and back out again. Weather prediction last 48 hours suggest a storm and swell over the coast of Port Dickson. Prediction gets better next 12 hours. We reach there around 8.00am in the morning and the weather was fantastic! Overcast and hardly any wind. We leave Port by 8.45am, the sea was calm flat! Sam couldn’t believe how flat it was 15nm from the coast. The only wave ripple that hit our boat came from the large tankers and huge container ship that passes our fishing spot. The first 1/3 of the day were quite. Over vikram, there are some surface activity of Queenfish hammering bait fish while a flock of birds cruises above to find the right window to scoop fish from the surface. It didn’t last long which gives a shot at those Queens. 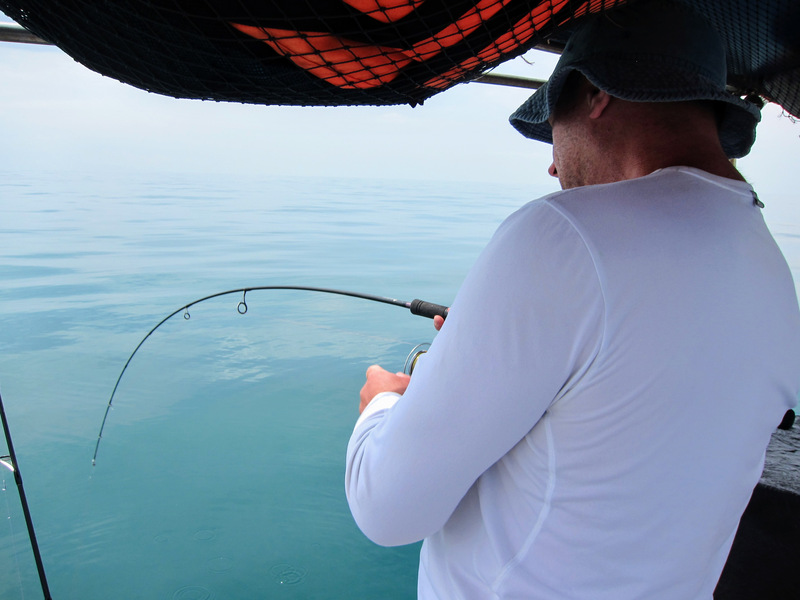 After an hour, we decided to move further up and fished along a small patch of corals. The new spot is situated in between the international shipping lanes. We have a new echo sounder on board, we were able to pin-point accurately our fishing ground. The first few drift were zero, but soon my jig were pulled strongly by an unknown fish. I did hooked it, plus there is a treble hook at the bottom of the jig, 1..2..3… it was off!. Sam got his moment too, a good size queenfish took his slow-pitch jig when he was dropping it. The fish moved upwards and shake the jig off.. 2 good strike but we lost it.. its a shame but that’s fishing, we don’t win all the time. Sam told me it was too quite out here, the sea was flat flat.. and all the sudden, BOOM! Fish On! The rod bends heavily, a good sign that its going to be a tough fighter! Finally, hard work paid off! Fish ON! Sam was right on to it, good hookup helps the hook penetrate to lip if the fish with ease and it as all about composure hauling in the fish. It was an intense fight, and once the fish was about 2/3 from the surface, the distinctive silvery body and large strong bony tail surfaces. 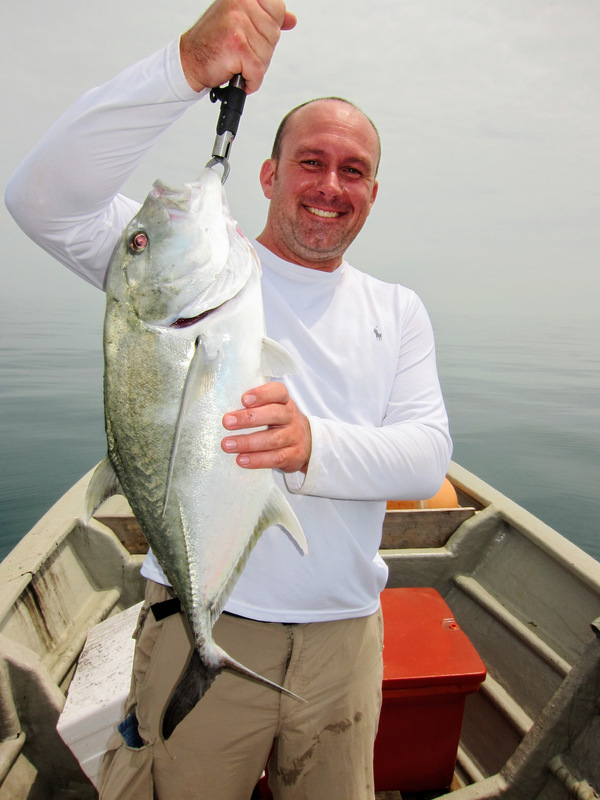 Sam Pascoe landed a Giant Trevally! Hell Yeah! 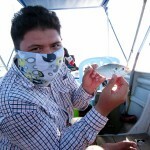 Giant Trevally of Port Dickson! Sam Pascoe with his trophy catch! We were fired up. This place starting to get to life. We had countless Yellow Tail Scad hookup on our Jig. A good 15cm size specimen are not afraid to whack our 150g metal jigs. Sam once got 2 Yellow Tail Scad on his jig lol. Fresh from the brutal battle with a GT, Sam Pascoe was on the fight again! I does put a good fight, but Sam were able to haul it steadily. Once it is on the surface, a beautiful Golden Snapper! Things just getting better and better! Round 2! Fresh from his GT battle, he was up to the second fight of the day! Trophy catch! 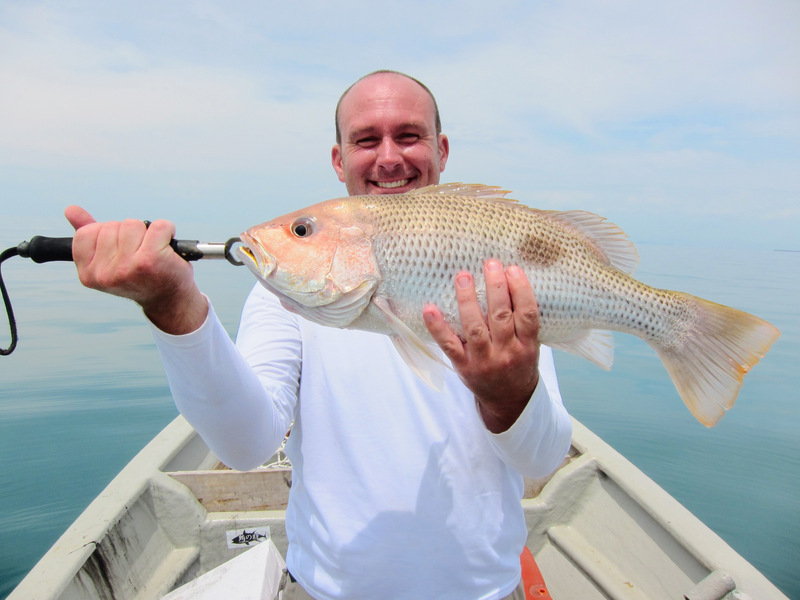 Golden Snapper, the prized catch when you are out fishing in Port Dickson! It was an awesome day indeed! Satisfied! We continue on fishing, this time with a sabiki rig. We were able to catch a lot of good size Yellow Tail Scad, I think close to 100 pieces. That will be good for dinner over the next few weeks. 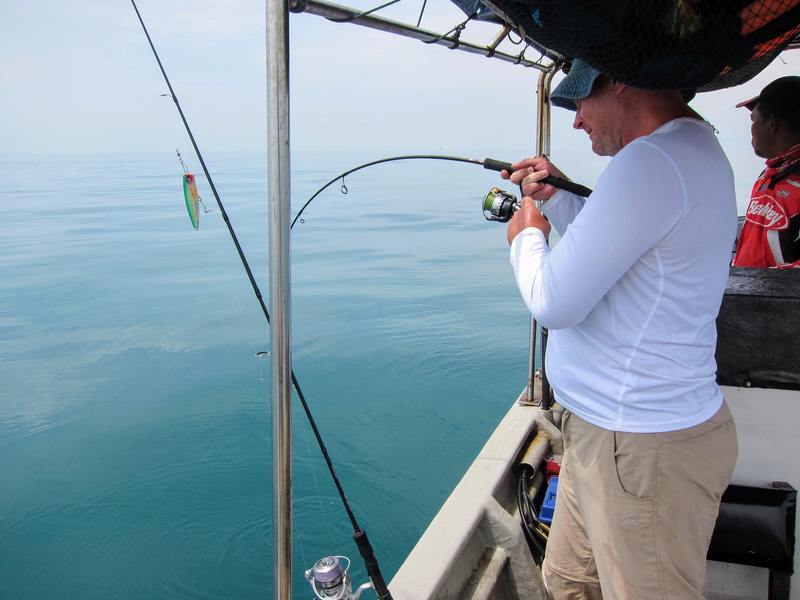 Once the Yellow Tail Scad were under control, we finally got 2 more good hook-up but could not convert! Maybe the hook wasn’t sharp enough and I face a similar issue when we were out in Jarak in January. We continue on fishing towards the shore. The wind starts to pick-up in the evening and it was getting a bit choppy. We ended the day and head back to jetty. I hope this trip was memorable for Sam Pascoe who traveled from UK to Asia via train. What a wonderful way to travel and via the Siberia-China route, it sounded like a great adventure. Thank you some Sam, and hopefully we will meet again the future :). Sam Pascoe of United Kingdom, relived our journey in Port Dickson! Thank You!